I first used a wood lathe in 1978 when I was 38. I'd been doing a lot of things until then, none of them related to wood. I saw John Barton's Creative Wood Working Course at Selkirk College as a way to expand my marketable skills. As part of the course I was repairing a chair and had to replace two rungs. John showed me how to turn them on the lathe. I saw the lathe as a basic tool which is occasionally useful but tends to gather dust in most shops. In 1982, during a trip to California with John Barton, I met Del Stubbs, an inspired and extremely talented woodturner. I watched him on the lathe and was amazed at what he was able to do. My interest was piqued. 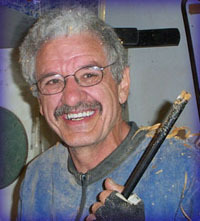 The next year I was hired as the Instructional Assistant for the Fine Woodworking Program at Selkirk College in Nelson. Over the next few years, with the help of how-to books and videos, I acquired basic lathe skills and shared them with any interested students. The more I turned, the more I liked it. When I heard Del Stubbs was giving a workshop on woodturning in Saskatoon in conjunction with the Fourth Turning and Design Conference in 1992, I signed up right away. For the first time I was in the company of other woodturners and it was a revelation - I knew where I'd been and now I had an indication of how far there was to go. In 1995 I retired from Selkirk College, bought a General wood lathe and went to New Zealand. I'd always wanted to go there, and thanks to the biennial artist and woodturning collaborations at Emma Lake, I had a list of woodturners to contact when I got off the plane. After three months living and working with some of New Zealand's top turners, I bought some Kiwi turning tools, came back to Canada, and began to turn in earnest. My work is available at the Craft Connection in Nelson, the Kootenay Gallery and the Station Museum Gift Shop in Castlegar, Handworks Gallery in Oliver, Mine: Stylesource in Vancouver, Northern Lights on Cleveland Avenue in Squamish, and Words End Booksellers in Ucluelet. 1996 17th Kootenay Boundary Regional Art Exhibition, Grand Forks, square-turned platter, "Celebration" selected to represent the West Kootenays at Images and Objects, the visual arts component of the BC Festival of the Arts in Pentiction. 1999 20th Kootenay Boundary Regional Art Exhibition in Nakusp, "Ball-Bearing Candle Holder" selected as one of the pieces of art representing the West Kootenays at artWORK, the visual arts component of the BC Festival of the Arts in Victoria. The piece then toured various communities in the Columbia Basin as part of ARTSAROUND. It's been over two decades since I became interested in the art and craft of woodturning. My interest in turning became a passion. My signed pieces now number over 1300. My work has been selected in juried art shows, and is collected internationally. Although I work with a powerful motor-driven lathe, my turnings are truly handmade. Each is the result of the interaction between a sharpened steel edge which I guide by eye and hand on a chosen piece of wood. I seek grace and animation in my turning so I may honour the spirit which gave life to the tree, a part of which I now use to create form. The actual contours of the tree define the rim of a natural edge bowl. Inside what appears as a nondescript block of wood I may discover exotic landscapes as the keen-edged gouge slices away that which does not contribute to the final form. Wood destined for the fireplace can turn into a warm-to-the-touch artifact or functional bowl. Just as no two trees are identical, neither are the pieces I turn. In order to achieve a quality finish I use ten successive grits of sandpaper followed by four coats of hand-rubbed, food-safe oil finish. A final, two-step buffing and the wood glows as if lit from within. By the time I sign one of my turnings, it has spent a significant amount of time in my hands. When so much of the wood we see is in the form of 2x4's or cabinet doors, we tend to ignore the source. Wood comes from trees. Coniferous trees grow straight and true. Their wood is a delight for building houses or furniture but somewhat bland for turning. Deciduous trees are more likely to twist as they grow, supporting heavy horizontal branches. Such stresses can appear in the wood as beautiful figure or interesting distortions. A grubby, hard-to-split piece of firewood can be a graceful artifact when turned.